Olhos de Água is a tiny Portuguese parish in the municipality of Albufeira. 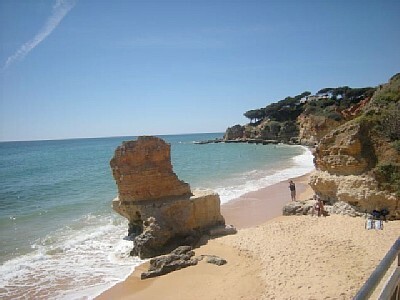 It’s located on the coast and is famous for having one of the best beaches on the Algarve which is why I was there. I can confirm that the beach is fantastic, so much quieter and more peaceful than the other beaches around but just as pretty. There were plenty of beachside restaurants & cafes to chose from but La Cigale stood out from most. While many were advertising burgers & hot dogs La Cigale’s board proudly displayed fresh sardines, salmon & mackerel, I was sold. The restaurant is situated right by the steps down to the beach, the balcony overhangs part of the beach and offers stunning views. 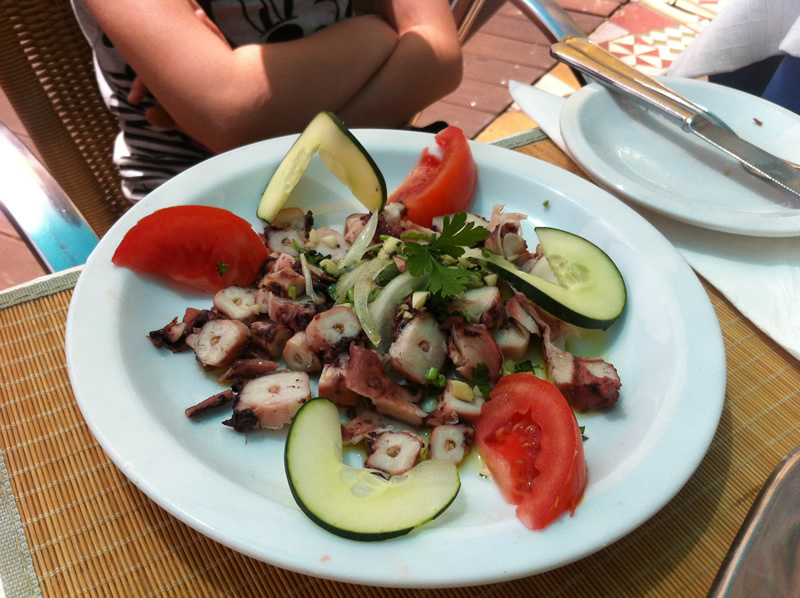 We ordered octopus salad to start which was very simple but enjoyable. We were also offered a portion of deep fried mackerel which i’d never tried before and looked good. I was surprised to find that they were cold, intentionally so as they were chilled not just room temperature, surprising but really worked well. The skin was incredibly crispy and the flesh was perfectly flaky. Definitely something i’ll be looking out for in future. 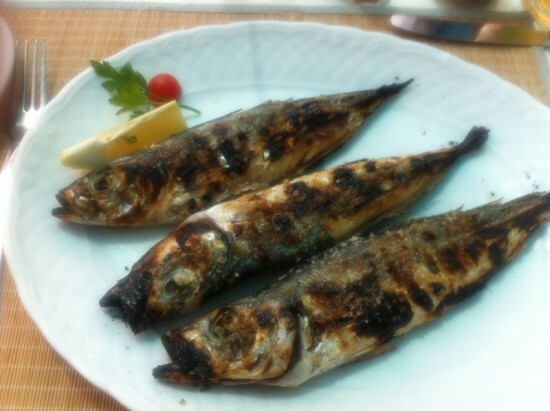 I’d forgotten that i’d also ordered grilled mackerel for my main course until they arrived. If i’d had the choice I wouldn’t have chosen the same fish for both courses but I enjoyed the grilled mackerel as well. 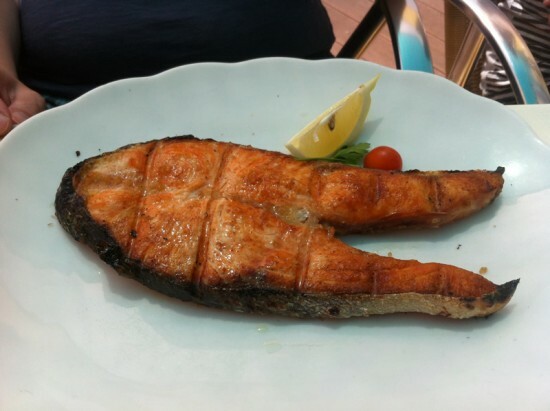 My partner ordered a salmon steak which was good too. Both were served with boiled new potatoes which looked undercooked for some reason but were actually perfectly cooked, soft and buttery and brilliant with the fish. We didn’t order desserts as we had an afternoon at the beach planned but I almost changed my mind when I saw some being taken to other tables. I really enjoyed my lunch at La Cigale. The views are stunning but the food lives up to the setting. It’s top quality, fresh fish cooked simply but very well. Service was good and it was very good value compared to some of the prices I saw at the hot dog & burger places near by.